The RainFlo 700 IG is a professional-class complete in-ground 700 gallon(expandable to 1700 gallons) rainwater harvesting system. Every component has been carefully selected and perfectly matched for optimal performance. Start using harvested rainwater today for many of your needs around the house. The Graf 700 Gallon Carat Tank - Graf Carat-S 700 Gallon Underground Cistern with Pedestrian Manway, 14" Telescopic Riser and Childproof PE Lid. Unlike most cisterns, the Carat can be left empty without the risk of collapsing. The Graf Optimax Pro Internal Filter Package - Internal self-cleaning cascade filter package. Includes filter, downpipe attachments, calming inlet, overflow siphon and Spannfix sleeve. Suitable for roof areas up to 3,750 sq. ft. The RainFlo .75 Horsepower Submersible Pump- Heavy-duty, high performance 115V/60Hz 1.25 horsepower 2-stage submersible pump with 1-1/4" threaded inlet to easily accept a floating extractor. Produces up to 29 GPM and up to 46 PSI. The RainFlo 115V Automatic Pump Controller - Provides automatic multifunction control for your water pump. The RainFlo 1-1/4" Floating Extractor - The floating extractor consists of an air-filled ball which suspends the floating inlet filter 4" below the water's surface where the cleanest and most oxygenated water resides. The RainFlo Pump Connection Kit with MPT to hose barb adapter and marine-grade stainless steel hose clamp to connect the pump to the floating extractor. 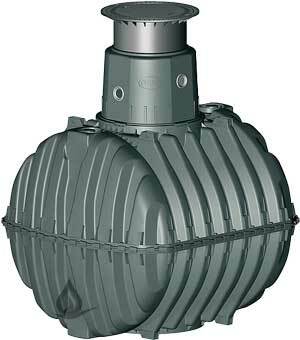 The 1-1/4" Heavy Duty Bulkhead Fitting is installed in the side of the tank dome for a watertight connection between the inside and outside of the tank for the pump output plumbing. Includes heavy duty telescopic dome shaft and cast iron lid for vehicle loading up to a maximum axle loading of 2.2 tons. Assembly of the Carat S tank step by step. How do I assemble a Carat S tank?